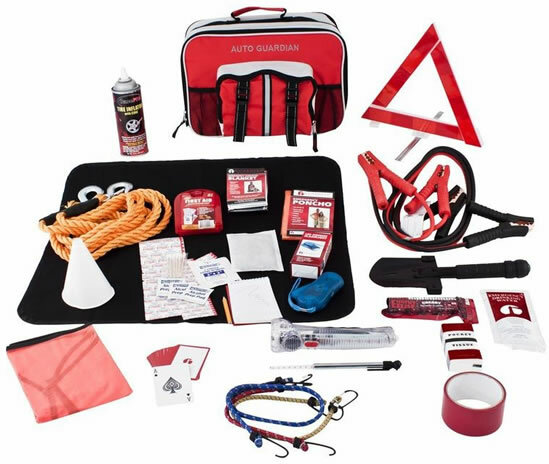 The Guardian brand Deluxe emergency car kit contains a lot of extras to help get you back on the road or to better deal with an unfortunate circumstance where you are stranded. With a warning triangle and a way to fix a flat, you may be able to get back on the road in no time. But if not, you'll be prepared to spend the night with an emergency blanket and even a 400 calorie snack and water. 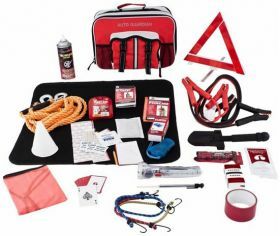 The gloves, shovel, tow rope and extra tools in this bag will help you get out if you get stuck. Food and Water: The food and water in this kit will comfortably provide you with adequate nutrition for a short time stranded without access to additional supplies. These products have a 5 year shelf life.